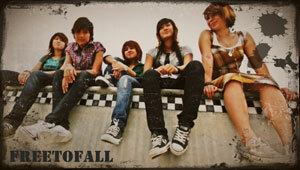 Free to Fall is an all girl band originating from Klang. The band was formed in Dec 2005 with most of them having little knowledge about playing instruments or making music. But having a shared passion and love for music has brought them to where they are now. They are a versatile band mostly dabbling in Pop rock music that also have a number of self composed songs; one of which made its way to the finals of a local song-writing competition. Today they have traveled all around, playing in schools, corporate functions, restaurants, churches and music festivals. The band include Jane Chong (Lead Vocals & Keyboards), Adeline Oh (Lead Guitar1 & Backing Vocals), Yin Har ( Lead Guitar), Jane Sebastian (Bass Guitar & Backing Vocals) and Ker Shin (Drums). Among their songs released are The Wait, Run Run Run, Falling Sunshine and Four walls. Keep a look out for them.